JERZY POTZ (20), the long-time LKS Lodz defender who capped his career in 1990 after seven seasons for Eintracht Frankfurt and another with Vfl Bad Nauheim in West Germany, represented POLAND four times at the Winter Olympic Games in addition to 11 appearances at the annual IIHF World Championships and still ranks second all-time with 204 games played for the Polska national team. Ever since the start of the 1970s, POLAND had shown remarkable improvement at ice hockey and, as a result, had been rewarded with the opportunity to host the upcoming International Ice Hockey World Championships tournament later in the spring. The Poles, after spending nearly all of the previous decade skating in the B Pool, had not only reached the top tier at the 1972 Sapporo Games by blanking West Germany in the qualification round but had sustained a place in the A Pool at the annual global tourney for the past three years running now. The first order of business, however, was the 1976 Winter Olympic Games at Innsbruck, where Poland would enter ranked fourth amongst the twelve participating nations. The Polish attack was spearheaded by the experienced Podhale Nowy Targ line of STEFAN CHOWANIEC, MIECZYSLAW JASKIERSKI and WALENTY ZIETARA. Both the 22-year-old Chowaniec as well as the 27-year-old Zietara were veterans of the ’72 Winter Games while no Polish player could top the eight goals scored by the 25-year-old Jaskierski at the last three IIHF World Championships. Jaskierski (19 goals) and Zietara (14 goals) would ultimately finish as the top two lamp-lighters for Poland in the eight major international tournaments (read, A Pool) at which it participated throughout the 1970s. The Poles, obviously looking ahead to the future, also included a trio of talented youngsters on their final 18-man roster at Innsbruck. 20-year-old ANDRZEJ ZABAWA of Baildon Katowice had already made his debut for Polska at the 1975 World Championships held in West Germany but the 22-year-old WIESLAW JOBCZYK of Baildon Katowice and 20-year-old HENRYK PYTEL of Zaglebie Sosnowiec were newcomers to the major international tournament scene. All three would go on to represent Poland at the Winter Games for the next three tournaments (as well as end their respective careers skating for clubs in both the West German first and second divisions). More importantly, Zabawa (99 goals), Jobczyk (88 goals) and Pytel (77 goals) would all later surpass the Poland national team scoring record set previously by Zietara. WALENTY ZIETARA (left) of Podhale Nowy Targ, who had a brief spell with ATSE Graz in Austria before closing out his career with Swiss second division EHC Duebendorf in 1981, finished as Poland’s the all-time leader with 72 goals in 179 games for the national team while winning the Golden Stick as the country’s top domestic player in 1972, 1977 and 1979; MIECZYSLAW JASKIERSKI (right), who put in a pair of seasons for army club Legia Warsaw before returning to Podhale Nowy Targ to start the 74/75 campaign, totaled 59 goals in 137 games for the national team of Poland before spending his last three years skating with EK Zell am See in Austria. The bulk of Poland’s Olympic experience was to be found on defense with four of the seven Sapporo returnees situated either on the blueline or in between the pipes. This included the two goaltenders, 31-year-old WALERY KOSYL of LKS Lodz and 29-year-old ANDRZEJ TKACZ of GKS Katowice, both of whom had already seen plenty of rubber at the international level. 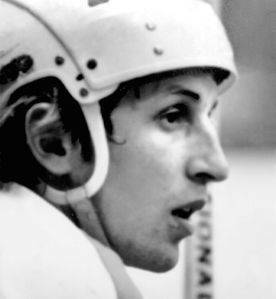 Tkacz, who was just a few months away from playing a major part in the greatest victory in the history of Polish ice hockey, had won the Golden Stick (Zloty Kij) as the nation’s premier player in 1975 and was destined to repeat this honor one year later. 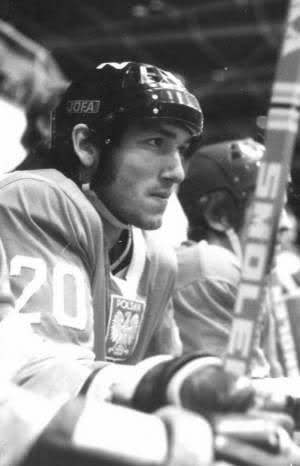 32-year-old rearguard ROBERT GORALCZYK of Baildon Katowice had first appeared for Poland a decade earlier at the A Pool of the 1966 IIHF World Championships in Ljubljana, Yugoslavia, and also scored two goals at the ’72 Sapporo Games. 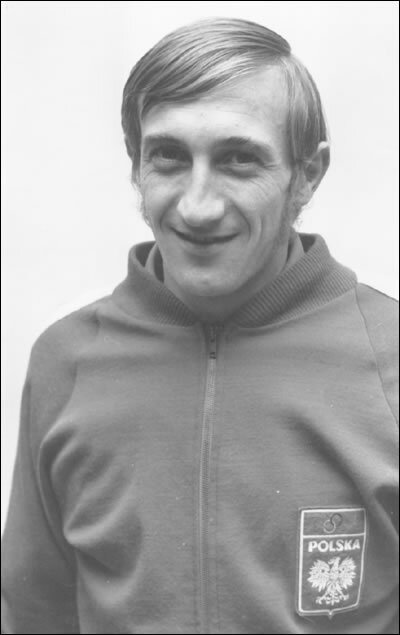 Defender JERZY POTZ of LKS Lodz was only just turning 23 at the start of the Innsbruck Games in 1976 but already had four World Championships and one Olympic tournment under his youthful belt. Although Winter Games novice ANDRZEJ SLOWAKIEWICZ had not appeared in Japan, the 25-year-old Podhale Nowy Targ blueline had already appeared at the World Championships in five of the last six seasons. 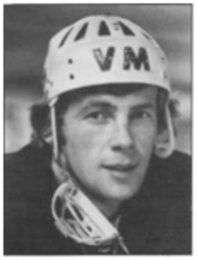 Poland had been soundly thrashed 20-0 by the Soviet Union at the 1973 IIHF World Championships in Moscow and the beatings had only been less severe (13-2 and 15-1) at the annual event of 1975 in West Germany. Still, the Poles had managed to manage a draw against the Finns at the World Champioships in both 1973 and 1974 and defeated the United States twice in West Germany, as well. And, Poland had taken down the Bundesrepublik Deutschland in three of the last four meetings between the two at the World Championships and Olympics dating back to 1969. Poland netminder ANDRZEJ TKACZ poses for a photograph in his Olympic team jacket; after meeting the necessary age requirements, the long-time GKS Katowice goaltender who appeared 145 times for the national team but became famous with just a single performance against the mighty U.S.S.R. at the 1976 IIHF World Championships in Katowice was finally allowed by authorities to travel west in the late 1970s and would end his career with clubs in West Germany (EHC Stuttgart), Switzerland (SC Zuerich) and Austria (VEU Feldkirch, EHC Kitzbuehel).